I am sure many of us remember back in January 2017 when we first saw the reveal of Project Octopath Traveler. It looked to be a promising throwback to SNES era JRPG’s and had many Nintendo fans hyped. 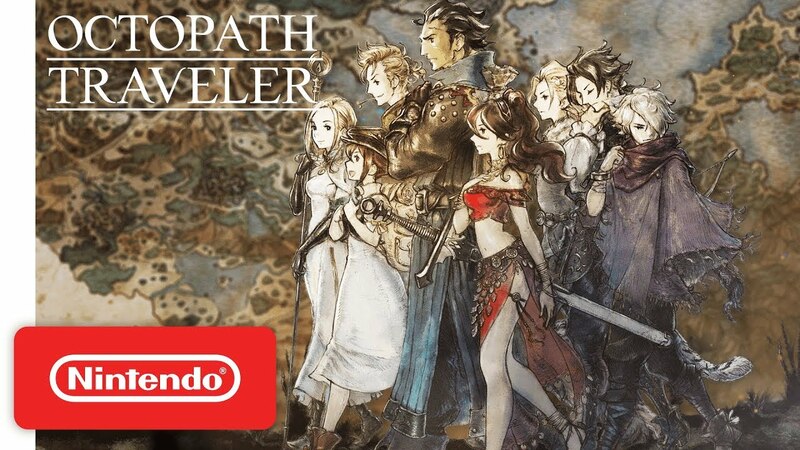 Does Octopath Traveler live up to that hype? In many ways, yes, it does. It’s proved its worth with great storytelling and character development, however, it’s slightly hindered by feeling a bit repetitive at times. At the beginning of the game, players get to choose between one of eight protagonists. As players continue along their path they may continue to add other adventurers in any order they choose. As you add each character you get to experience their story. Once all party members have joined up, you can continue along each of their respective stories. With eight separate stories to tell it can be very easy for some character origins to feel boring or uninteresting. In Octopath Traveler, this isn’t the case, as it manages to give each story arc a well written and interesting feel. There wasn’t a point in any tale that felt dull, instead, it kept players wanting to know what happens next. Once players have experienced all the opening plotlines they can continue the next chapter for any character at any time. 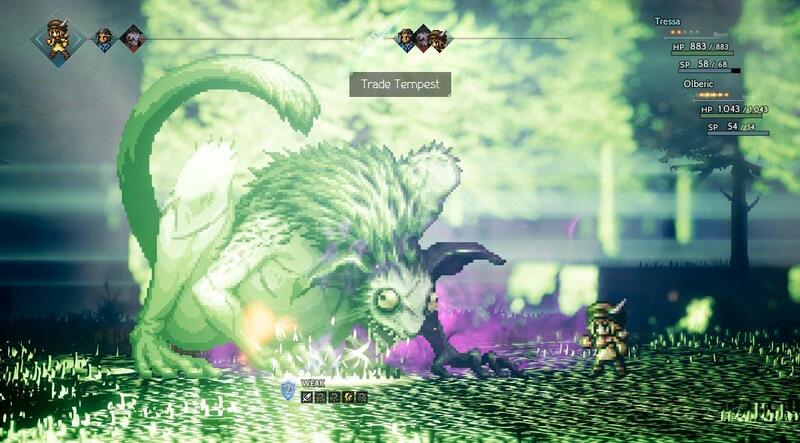 One of the best things about Octopath Traveler is each character not only has their own unique story but also has their own unique abilities as well. My favorite Traveler being H’aanit the hunter because of her brave story as well as ability, which is to capture a beast and summon them into battle to attack enemies. Aside from unique abilities, every party member has their own job class and skill set to match. The drawback to recruiting a new character is it feels a bit repetitive because each time a new party member is added there’s a repeating flow of events. There’s a cutscene introduction, followed by a short bit of gameplay, then back into a cutscene, and finally followed by some sort of dungeon ending in a boss battle that must be defeated before the character joins the party. At times it also feels a bit grindy to get to levels in order to defeat certain bosses. Although not a huge deal, some may find it a bit tiring. The combat system doesn’t feel overly complicated to learn, which allows gameplay to feel accessible for everyone to grasp. However, boss battles at times seem a bit flat. Most boss battles consist of a large enemy being guarded by one or two minions and using the same strategy, but finding their weakness is key, and breaking shield guards is a must. Once you’ve done that, continue to attack as many times as possible before they recover. 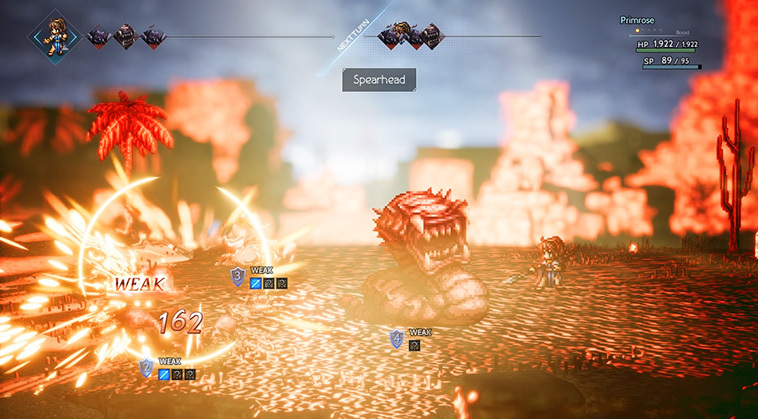 In the end, despite a few drawbacks, Octopath Traveler lives up to the hype of the throwback style of gameplay. Allowing players to choose one of eight characters is an interesting concept. Giving players the option to choose which character to add to the party also adds a a great deal of strategy. Visuals, as well as music, are both great. They managed to do exactly what was set out to do: make a modern JRPG with retro aesthetics. Longtime JRPG fans or even newcomers should certainly take the time to play this game. 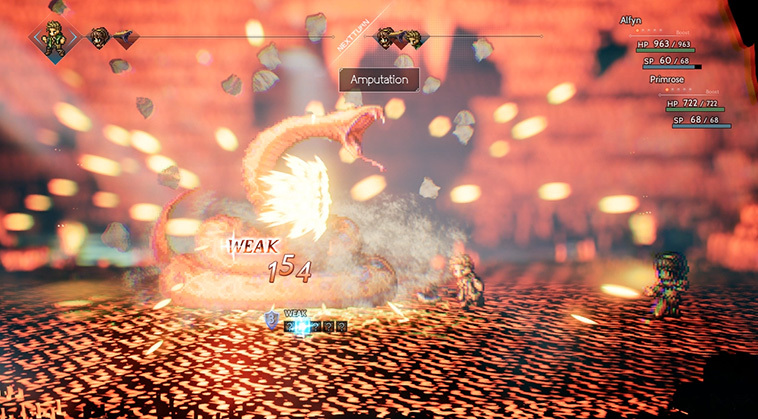 In the end, despite a few drawbacks, Octopath Traveler lives up to the hype of the throwback style of gameplay. Allowing players to choose one of eight characters is an interesting concept. Giving players the option to choose which character to add to the party also adds a great deal of strategy. Visuals, as well as music, are both great. They managed to do exactly what was set out to do: make a modern JRPG with retro aesthetics. Long time JRPG fans or even newcomers should certainly take the time to play this game.